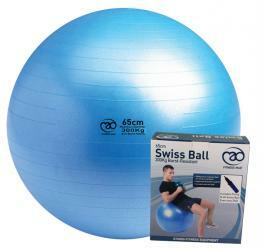 Burst Resistant Swiss Ball with exercise DVD and pump. This ball is burst-resistant and has a load rating of 300kg. Perfect for Fit Ball workouts, Yoga, Pilates or physiotherapy and can be use as a chair to aid with postural problems. The ball comes complete with a comprehensive work out DVD including 40 great Swiss ball work outs including warming up, body weight excercises and dumbbell work outs using the ball. Safety Tests: Rated as suitable for 300Kg load. SGS Labs tested as burst-resistant at over 500Kg static load. SGS Labs tested with a static load of over 1.5 tons without failure. To suit: those over 5' 10"